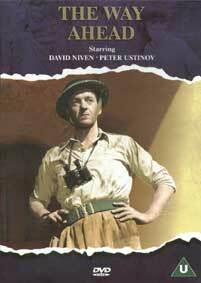 David Niven & Peter Ustinov star in this excellent story of the transition from civilian to military life by a group of new recruits. An excellent Black & White wartime film produced in 1944, directed by Carol Reed and lasting 110 mins. This film was originally produced as a training film for new recruits but proved so successful that it was put on general release and became quite successful. The story follows a group of new army recruits from their diverse civilian lives to their eventual deployment in battle. The excellent script by Eric Ambler and Peter Ustinov plus the all star cast including David Niven, Peter Ustinov, John Laurie, Stanley Holloway, Trevor Howard and Jimmy Hanley make the film shine out as a classic wartime film. Both the military and the civilian scenes show accurate renditions of wartime Britain and I have been told by those that lived through these times that the very accurate scenes of basic training brought many memories flooding back. The film was obviously made with a serious purpose but does have a lot of humour thrown in as well. It's a great film that I thoroughly enjoyed and would heartily recommend.